Welcome to the colourful SABAH FEST 2012. Sabah Fest is the largest cultural event among the many of Sabah's multicultural attractions and for the first time this year the event will be held at the newly-opened 600-capacity Auditorium, Kompleks JKKN Sabah , Mile 2, Jalan Penampang, Kota Kinabalu from 3rd - 5th May 2012. West Coast ethnic groups he had encountered throughout his barter trade trips. The story line is scripted in such a way to showcase the authentic, age-old dances, rituals and ceremonies of the Bonggi of Banggi Island, Dusun Kimaragang of Kota Marudu, the Lotud of Tuaran, the Bajau of Kota Belud, the Bruneian of Southwest Sabah, the Bisaya of Beaufort and the Dusun Tatana of Kuala Penyu. 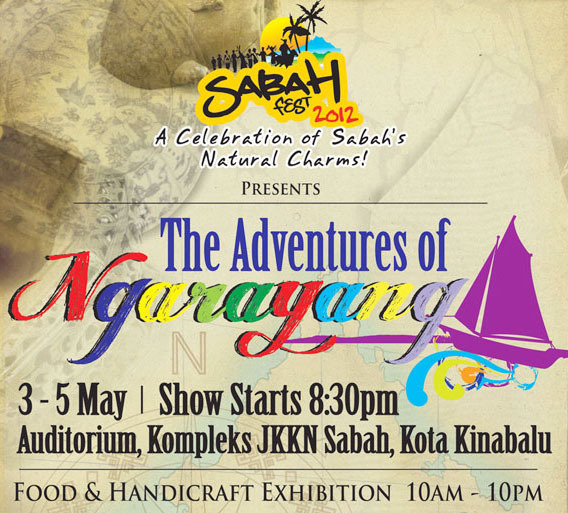 A young adventurer named Ngarayang meaning ‘trader’ plied the west coast of Sabah bartering and distributing a variety of goods much sought after by the coastal communities. He was gifted with a charming look and a flair for story-telling. He captivated his audience wherever he went with wonderous stories of his travels and tales of cultures he encountered. On one of his legendary journeys, the charms of a beautiful princess captured his heart, and while tales of mystical rituals, captivating dances and mesmerising music in a land of exotic people and cultures fascinated him, his heart yearned to see his princess again. To find out what happened to Ngarayang in the end, come and find out for yourself. 8) The Dusun Tatana Bakanjar (martial arts) integrated with the Moginum (drinking) ritual and dance called Sayau Loyop. If you've noticed, these ethnic groups reside in the West Coast of Sabah. Similar to the Sabah Fest 2011 at Sutera Magellan, there will be no entrance fee for visitors visiting the exhibitors booths. For the main show, tickets are priced at RM30 and RM50 per show. The building is said to be conforming to the green building guidelines, so, let's visit the new National Culture and Arts Department auditorium this May. Sahah, or Malaysia, is a place rich in various cultures. @rainfield61. That's why we love the unity in diversity in this country. @tehr. Klu sempat mlawat, I'll post some pics.